Inside Devinly Decadence on Quantum of the Seas. 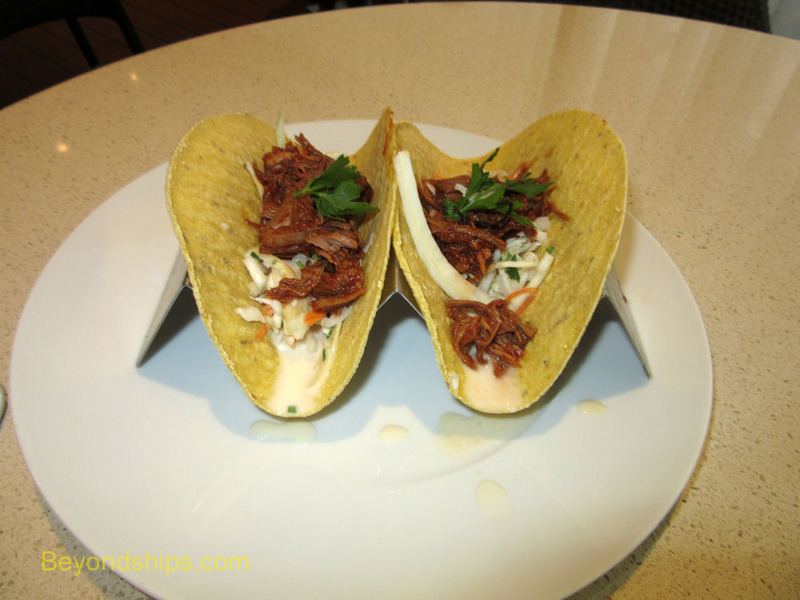 Devinly Decadence is the healthy alternative restaurant on Quantum of the Seas. It was developed in conjunction with celebrity chef Devin Alexander, known for several cook books and her appearances on the television show “The Biggest Loser.” All of the dishes served at this venue are under 500 calories. Unfortunately, alarm bells go off in some cruisers' minds when they hear that a shipboard restaurant serves healthy food. To them, healthy food is just code for boring and/or tasteless. Besides you go on a cruise to overindulge. 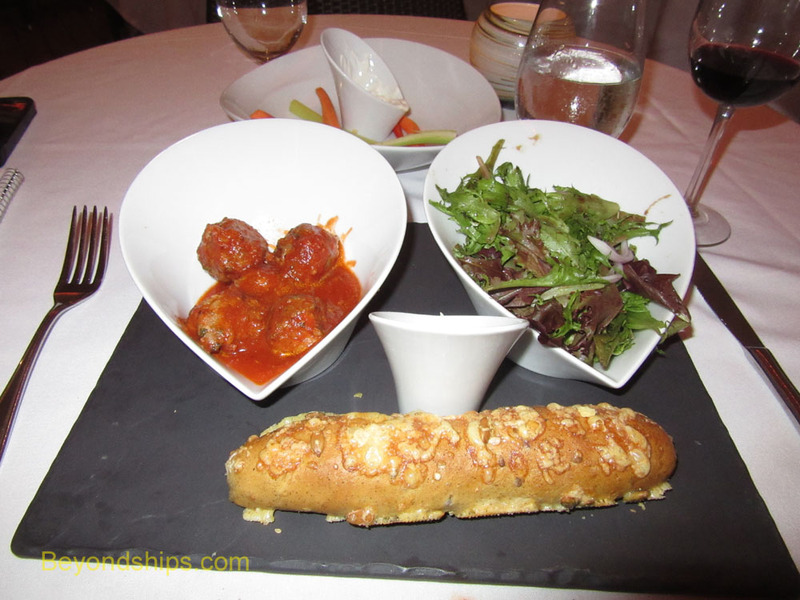 Like the fitness center, a healthy restaurant is someplace you go at the end of the cruise when you are feeling guilty after days of culinary excess. The reason such thinking is unfortunate is that the food at Devinly Decadence is neither boring nor tasteless and so these people are missing out on a very enjoyable experience. To illustrate, the lunch menu includes the Little Dev Burger. Like those served under the Golden Arches, this is a two deck burger on a seeded bun with lettuce, onion, pickle and a special sauce. However, only lean beef with the fat trimmed away is used here. Similarly, only low fat ingredients make up the rest of this burger. The result is a burger bursting with flavor. In fact, it is not just good compared to other healthy alternative burgers, the Little Dev Burger holds its own against any burger at sea including the awesome Guy's Burgers served on some of the Carnival ships. And since the Little Dev is less caloric, there is less to feel guilty about if you have more than one. Included on the dinner menu at Devinly Decadence are two versions of pizza. These are flat bread pizzas with a very thin crust. The Chicken Wing version is powerfully spicy and utilizes high quality chicken. Once again, a tremendously flavorful dish. This venue also offers more traditional healthy dishes. 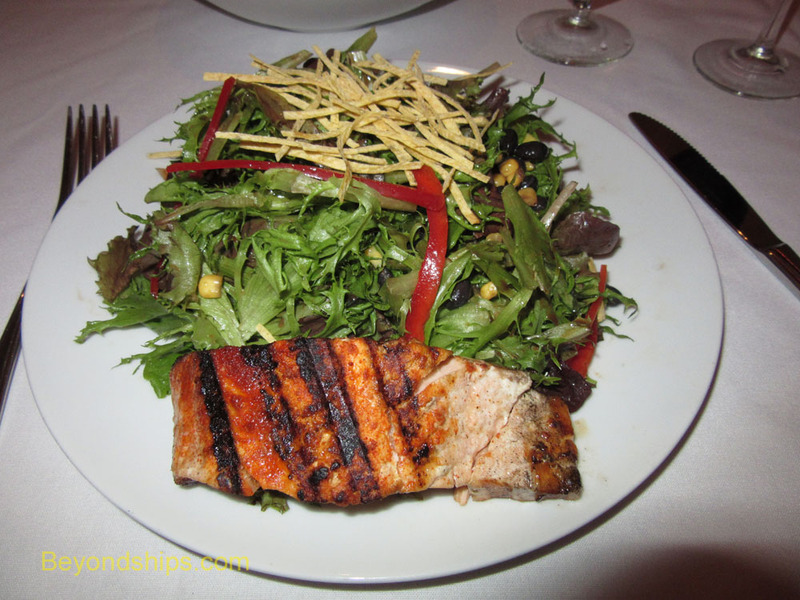 For example, on the dinner menu there is a grilled salmon salad. This includes a full salmon fillet and lettuce mixed with corn and beans. It comes with a vinaigrette-style dressing. Again, lots of flavor. At this point, it makes sense to say a word about the portions. One way of reducing the number of calories in a dish is to reduce the size of the portions and in such instances the customers leave the restaurant as hungry as when they arrived. However, be assured that such an approach is not being used at Devinly Decadence. Indeed, even though they are not listed as entrees, the Salmon Salad and the pizza discussed above would each suffice as a meal in themselves. Of course, not every dish is a superstar. The meatballs marinara and the pulled pork tacos were both fine but not extraordinary. The décor of Devinly Decadence is the least interesting of the specialty restaurants on Quantum of the Seas. It is a rather plain room with mostly off-white interior walls. The most colorful thing about them is the flat screen television on one wall which shows Ms. Alexander cooking various dishes. In contrast, the exterior walls are floor to ceiling glass, which look out into the Solarium, one of the prettiest spaces on the ship. However, each time we were there, white curtains had been drawn across the glass walls and so blocked the view. Service at this restaurant was good and efficient. At lunch, guests can supplement the dishes served by the waiters by gong to a buffet counter, which has soups, salads and desserts. Above: The Little Dev Burger. Below: Bof-alo Chicken Wing Pizza. Above: Grilled Salmon Chipolte Salad.